For as long as there have been blogs and discussion forums, there have been trolls. A troll is a commenter who hangs around your site primarily to annoy and aggravate you and your readers. Trolling is different from simply being critical. Not all of your readers will agree with everything you write — in fact, we bet your favorite readers are the ones who swing by for a healthy intellectual debate! But a troll’s comments rarely have anything to do with the topic at hand — they’re there to anger and intimidate others, and derail your discussion. In our last post, we focused on commenting etiquette, so this time, let’s move across the table and talk about moderating your comments. IntenseDebate offers some powerful moderation options. On your Moderation Settings page, you can customize your settings to filter and moderate by keywords, the number of links in a comment, and commenters’ email addresses or IP addresses. You can also enable a profanity filter, ban specific usernames, and automatically approve comments from users who meet a minimum reputation score, which you can specify in your settings. Reply to comments. Your job doesn’t end when you hit the “publish” button, right? When readers leave comments, keep the conversation going in real time. Use the Reply-By-Email feature to respond swiftly to comments via email — especially when you’re on the go — before your thoughts slip your mind. But don’t reply to every comment. If you receive a lot of comments and you reply to each with a simple “thanks,” your discussion will suffer. These comments, while friendly, are terse and ultimately meaningless. Where’s the debate? Your replies should always add something substantial that builds on the conversation, so avoid stagnant, dead-end comments. Keep it error-free. Carefully read every comment you approve and edit if needed. While these are other people’s words and thoughts, this is ultimately your site, so treat it like a newspaper or publication. Ensure the copy, whether in your own posts or in the discussion threads, is clean and free of mistakes and misspellings. Trust us — errors looks bad. Period. Police, but do so politely. We know you love lively debates, but don’t encourage nasty and abusive comments. They intimidate new readers, derail conversations, and distract you from good blogging. It’s your site — set your rules! Give people polite warnings, but if they continue on with offensive comments, ban them. Your commenters also have the ability to report abusive comments with the “Report” button. Play around with the keyword filter. The keyword filter tool on your Moderation Settings page is handy. Entering a keyword will flag any instance of that particular word, including partial matches, so be careful when adding two or three letter keywords — “the,” for example, includes words like “theme,” “theory,” etc. Once you’ve gotten the hang of it, this filter tool becomes quite powerful. Knock on your neighbors’ doors, too. Networking and developing intellectual and professional connections with your readers is one of the best parts of blogging. If you have loyal commenters, visit and comment thoughtfully on their sites as well, keeping in mind the commenting tips you’ve learned. For more details on moderating comments, visit the moderation support page. As for IntenseDebate updates, we’ve upgraded servers to PHP5.4 to improve performance, removed OpenID, and fixed a bug with Facebook Connect that prevented you from logging in using Facebook if you were already logged into Facebook. If you have questions or comments about IntenseDebate, send us a note. 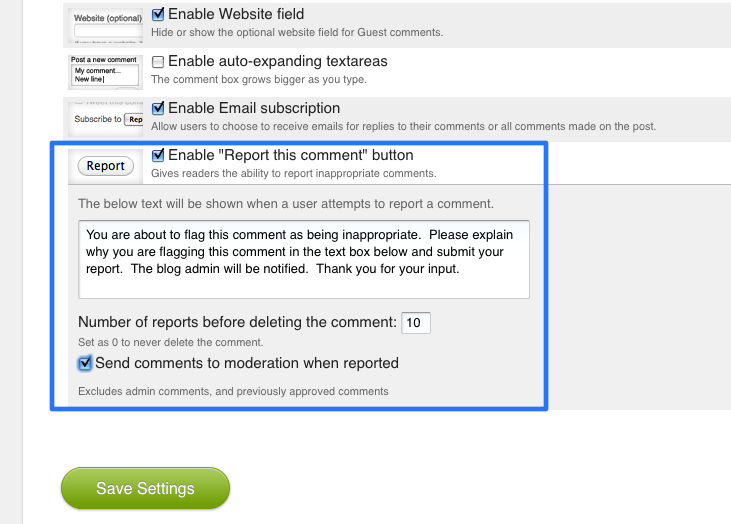 We released a cool new setting for reported comments (comments that your readers flag as inappropriate). You can now opt to have the comments automatically put into moderation for review. This handy option can help you and your readers keep your comments clean and debates friendly. To enable this option, visit your Comments Settings, and check the box next to Send comments to moderation when reported (located at the bottom of the page). Make sure you save your settings. This setting excludes comments posted by site admins and moderators, as well as comments that you have already approved. While you’re there you can also take advantage of our Auto-Delete setting for reported comments. With the Auto-Delete option, you can set a maximum number of times that a comment is reported before the comment is deleted. This is another super-handy feature for crowdsourcing moderation. Both of these options are based entirely on your feedback, and we’re happy to deliver them!